Can you change screen timeout on iPhone? Yes, Not new latest iOS but changed the path to managing it in setting app. 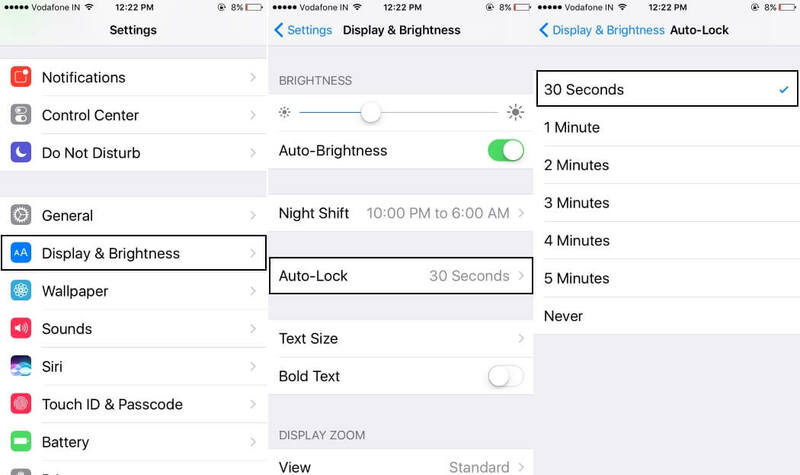 Get full guide on how Auto lock Screen time on iPhone/ iPad works and How we can make our gadgets user-friendly. So it saves battery consumption, Time and Easy to access when you want with new changes for unlock screen, Raise to Wakeup that activates lock screen. Auto lock screen doesn’t work on any third party application, just like android or other mobile platforms. So go with below guide and manage it beautifully from setting app. Lock screen with the Passcode is a proper coordination between security and Device optimization features by Apple. Step 1: Go to the Settings App in iPhone/ iPad. Step 2: Next Tap on Display & Brightness. Choose correct Time interval appeared on screen (Seconds/ Minutes) and make your change screen dim time on iPhone or iPad. Now iOS 12 or later: if Face ID is enabled for lock screen or for all on your iPhone. Then you have only one options under Auto-lock: Immediately, You can set or find more option after turn off Face for lock screen or Remove Face ID. 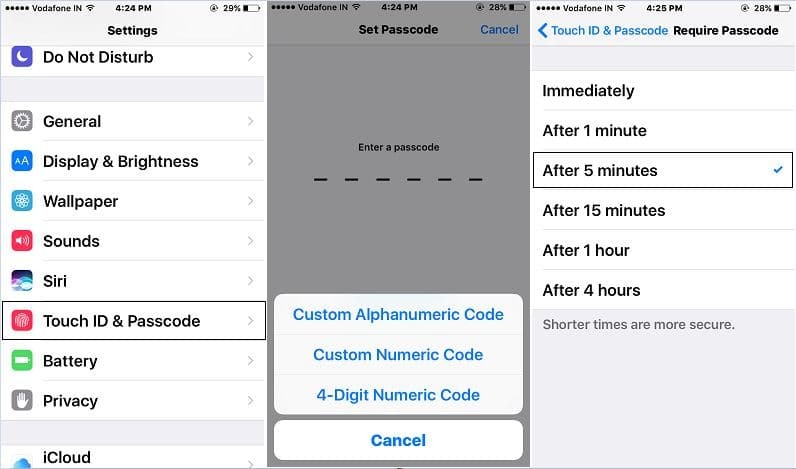 Check this tutorial: Change auto-lock interval on iPhone. Step 3: Don’t want any auto lock screen features, choose Never. 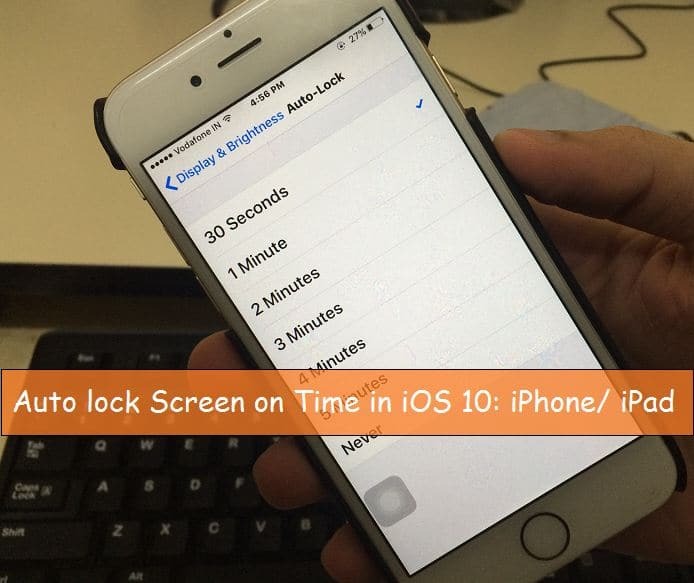 Auto lock or Screen Timeout interval only works for close your iPhone/ iPad screen, so no one can access your screen without press home button to unlock in iOS 11 or Slide to unlock in iOS 10/ iOS 9/ iOS 8. Strongest security Touch ID and Passcode now also used for unlocking screen, After Screen Timeout you need to open it using Touch ID/ Passcode, if you enabled (Settings > Touch ID & Passcode > Turn of Passcode – 4 Digits or 6 Digits). Note: For easy access or More battery saving I suggest you keep minimum time interval for Auto lock and keep 2 or 3 Minutes for Passcode or Touch ID activation on the locked screen. Now whenever your screen will time out, you need to press the home button only once not to enter Passcode or Use Fingerprint. You might also like: Auto Unlock macOS Sierra using the Apple watch. The tip applicable for all iPhone XS Max, XS, XR, X, iPhone 8/ 8 Plus, iPhone 7/ 7 Plus, iPhone 6S/ 6S Plus/ SE and iPad Pro, Air and Mini users. Hope you will find an excellent source change screen timeout iPhone/ iPad running iOS 11. Keep updating you and Friends by sharing it on Facebook, Google+ or Twitter.